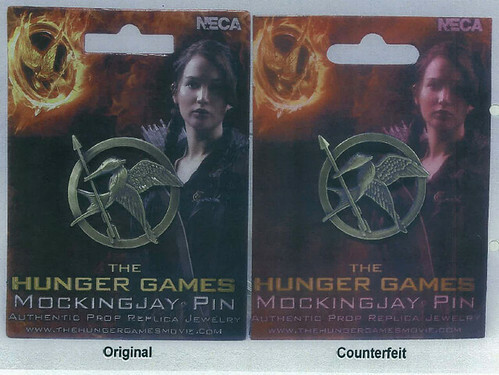 An alleged counterfeiter is selling a "Mockingjay Pin," an important symbol in the story of Katniss Everdeen, and an item so prized that an antitrust warning was sent when one retailer couldn't gain access to it. Lionsgate Entertainment is suing an alleged Hunger Games counterfeiter who hasn't paid proper tribute to the studio. In a lawsuit that has been filed in California federal court, the studio is targeting a company, Yagoozon, that seemingly does most of its business selling novelties on Amazon.com. The big item in question is a "Mockingjay Pin." It's no ordinary item. A version of this pin was used on the cover of Suzanne Collins' book and also is central to the recently introduced official poster for the next film in the trilogy -- The Hunger Games: Catching Fire. According to the Hunger Games wikia, the pin was Katniss Everdeen's tribute token in the 74th and 75th Hunger Games and became one of the symbols of the rebellion against the Capitol. It has also become a symbol of a billion-dollar franchise, and Lionsgate has taken a number of steps to register the "Mockingjay logo" at the Trademark Office. Now, Lionsgate is aghast over an item it says is deceiving customers and diluting its Hunger Game marks. The way this copyright and trademark lawsuit emanated is somewhat unusual. According to the 160-page complaint -- full of colorful pictures and trademark applications -- Lionsgate has licensed to third parties the rights to sell various items and merchandise. Among the licensees is the National Entertainment Collectibles Association, which sells Hunger Games calendars, card games, action figures, bookmarks, board games, bags, watches, necklaces, earrings, bracelets and, yes, a replica of the Mockingjay Pin. The lawsuit says that in March and April 2012, the defendants attempted to purchase merchandise from NECA, which refused the request. "We have been a regular buyer of NECA products throughout the 2011 year, we are a very large seller and growing fast and we are finding out now that our competition is allowed exclusive retail rights to a specific license that NECA is facilitating: Hunger Games. We feel this is unlawful given the equal rights bestowed to retail competitors under the Sherman Antitrust Act, specifically the subdivisions of the Robinson Patman Act. We feel it is flagrantly unlawful that almost every one of our competition is selling an item that we have to sign a disclaimer to not sell in the same venue." Later that month, Joseph got a response to his suggestion that his company (also known as Winning Costumes LLC) was "victim of a large scale antitrust violation by NECA and Lionsgate in the retail market." The accusations were called unfounded and meritless. Lionsgate says that it then learned that the defendants were offering counterfeit Hunger Games merchandise for sale online. The pin appears to have been put up for sale on Amazon.com, which has recently caught studio attention. In the last few months, for example, Warner Bros. has filed dozens of lawsuits against sellers on the e-commerce website who are allegedly selling counterfeit goods. Joseph has been contacted, and if we hear a full response from the company, we'll update. In the meantime, here's a look from the court documents of the item that has triggered litigation. Lionsgate is demanding an injunction, a recall, a listing of manufacturing suppliers, and monetary damages. The studio is represented by Jill Pietrini and Paul A. Bost at Sheppard, Mullin, Richter & Hampton.